The jury consisting of Janice Madden, Carlos Azzoni and Erik Verhoef chose the article "Network proximity in the geography of research collaboration" by Laurent R. Bergé, published in Volume 94, Issue 4, November 2017, Pages: 785-815 as the winner of the Martin Beckmann Prize as the best paper published in Papers in Regional Science in 2017. Motivation: Through an elegant scientific approach, the paper replies to the questions of how network proximity influences the structure of inter-regional collaborations and how it interacts with geography. A new, theoretically grounded, measure of inter-regional network proximity is introduced. The jury consisting of Janice Madden, Carlos Azzoni and Erik Verhoef chose the article "Borrowing size in networks of cities: City size, network connectivity and metropolitan functions in Europe" by Evert J. Meijers, Martijn J. Burger, Marloes M. Hoogerbrugge, published in Volume 95, Issue 1, Marh 2016, Pages: 181-198 as the winner of the Martin Beckmann Prize as the best paper published in Papers in Regional Science in 2016. Motivation: Through an elegant scientific approach, the paper interprets the contrast that exists between the current dynamics in the Western European urban system and the bourgeoning literature stressing the importance of agglomeration for economic growth. The papers argues that rise of ‘city network economies’ leads to processes of borrowed size as well as the rise of agglomeration shadows in networks of cities, and finds that network connectivity positively enhances the presence of metropolitan functions, even if local size remains the most significant determinant for most types of functions. Based on the originality of the interest in the topic, and the important results achieved, the jury concluded that the paper was the best published one in 2016. The jury consisting of Antoine Bailly, Masahisa Fujita, Roberta Capello and Erik Verhoef chose the article "Fiscal decentralization and regional disparities: The importance of good governance" by Andreas P. Kyriacou, Leonel Muinelo-Gallo, Oriol Roca-Sagalés, published in Volume 94, Issue 1, Marh 2015, Pages: 89-108 as the winner of the Martin Beckmann Prize as the best paper published in Papers in Regional Science in 2015. Motivation: The paper deals with the measurement of the role of government quality in mediating the relationship between fiscal decentralization and regional disparities. The paper, based on evidence from a sample of 24 OECD countries over the period 1984 to 2006, provides support to the idea that fiscal decentralization has the potential to reduce income differences across regions but that this potential may not be realized because of governance problems associated with sub-national authorities. Based on the originality of the interest in the topic, and the important results achieved, the jury concluded that the paper was the best published one in 2015. The jury consisting of Antoine Bailly, Masahisa Fujita, Roberta Capello and Erik Verhoef chose the article "The sources of the urban wage premium by worker skills: Spatial sorting or agglomeration economies?" by Martin Andersson, Johan Klaesson and Johan P Larsson published in Volume 93, Issue 4, November 2014, Pages: 727-747 as the winner of the Martin Beckmann Prize as the best paper published in Papers in Regional Science in 2014. Motivation: The paper deals with the estimate of the respective importance of spatial sorting and agglomeration economies in explaining the urban wage premium for workers with different sets of skills. The paper is an innovative piece of work in the complex field of identifying the sources of differences in wages among cities. It provides empirical evidence on which type of skills are rewarded by density, and bear on the broader question of the contexts in which agglomeration is important. Based on the originality of the methodology used, and the important results achieved, the jury concluded that the paper was the best published one in 2014. The jury consisting of Masahisa Fujita, Antoine Bailly, Roberta Capello and Erik Verhoef chose the article "Measuring the effects of European Regional Policy on economic growth: A regression discontinuity approach" by Guido Pellegrini, Flavia Terribile, Ornella Tarola, Teo Muccigrosso and Federica Busillo published in Volume 92, Issue 1, March 2013, Pages: 217-233 as the winner of the Martin Beckmann Prize as the best paper published in Papers in Regional Science in 2013. Motivation: Based on the originality of the methodology used to develop a very important topic, and the important results achieved, the jury concluded unanimously that the paper was the best published one in 2013. It deals with the the assessment of the Regional Policy effects through a non-experimental comparison group method, the regression discontinuity design, and a novel regional dataset for the 1994–2006 period.The paper is an innovative piece of work in the complex field of regional policy evaluation. The jury consisting of Masahisa Fujita, Jean Paelinck, Roberta Capello and Jouke van Dijk chose the article "Social networks and regional recruitment of foreign labour: Firm recruitment methods and spatial sorting in Denmark" by Torben Dall Schmidt and Peter Sandholt Jensen published in Volume 91, Issue 4, November 2012, Pages: 795-821 as the winner of the Martin Beckmann Prize as the best paper published in Papers in Regional Science in 2012. Motivation: Based on the criteria a. originality of the topic b. theoretical foundations c. appropriate methodology and d. empirical relevance the jury concluded unanimously that your paper was the best paper. It examines the interesting and complex issue of social networks in regional recruitment and inflows of foreign labor. Using both cross-section analysis and panel data analysis in Denmark, the paper successfully shows the importance of regional social networks and spatial sorting in the recruitment and inflows of foreign labor. The paper is innovative in empirical study on a new and complex issue of international importance. The jury of the Martin Beckmann Annual Award for 2012 consisting of Jouke van Dijk, Masahisa Fujita, Jean H. Paelinck and John M. Quigley selected for the Martin Beckmann Prize 2012 as clear winner Michael Fritsch and Holger Graffor the paper "How sub-national conditions affect regional innovation systems: The case of the two Germanys", published in Volume 90 Number 2 June 2011 as the best paper published in Papers in Regional Science in 2011. Motivation: The paper by Fritsch and Graf represents an innovative empirical research on regional innovation systems RIS). In comparison of two RIS in East Germany with two RSI in West Germany, with careful study of characteristics of the inventor networks within and surrounding the four RIS, the paper convincingly demonstrates that an nalysis of RIS should account for the (sub-)national economic conditions as well as for the region's position in its spatial environment.The paper will contribute significantly to the empirical and theoretical study of RIS in the future. The Award recognizes annually a regional science scholar or scholars who have demonstrated innovation and excellence in Regional Science research through the publication of a paper of outstanding merit in Papers in Regional Science. 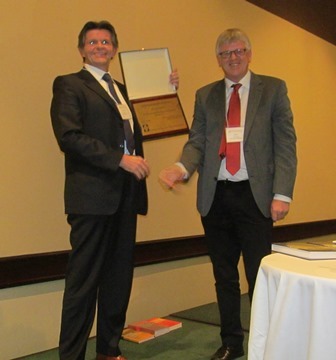 2.1 The award is established to recognize and honour the outstanding career and contribution of Professor Martin Beckmann, an internationally recognized regional scientist and economist of outstanding merit, and who is a foundation fellow of the RSAI. 2.2 The Award is made annually for the best paper published in the Issues comprising an annual Volume of Papers in Regional Science. 2.3 Normally no more that one paper may be selected from an annual Volume of Papers in Regional Science, but in exceptional circumstances two (2) papers may be selected for the Award. 2.4 A paper selected for the Award must demonstrate innovation and excellent in research in regional science. 2.5 The Award carries a cash prize of the equivalent of 500 pounds sterling. 3.1 In the first quarter of each year, the three (3) Editors of Papers in Regional Science will convene in person and/or by email and /or by teleconference to review the papers published in the Volume of Papers in Regional Science in the previous year and choose a short list of up to five (5) papers which they deem as suitable for consideration for the Martin Beckmann Annual Award for the Best Paper in Papers in Regional Science. 3.2 The Editor-in Chief of Papers in Regional Science will then send the papers for appraisal to a Jury comprising the Editor-in Chief and three (3) Fellows of RSAI chosen by the Editor-in-Chief of Papers in Regional Science in consultation with the RSAI President. 3.3 The Jury will appraise and rank the papers during February that year, and in March a meeting of the Jury will be convened by the Editor-in Chief of papers in Regional Science (meeting in person and/or by email/teleconference) in March to select the paper or papers to receive the Award. 3.4 The Editor-in-Chief of Papers in Regional Science will inform the Executive Director of RSAI of the decision of the Jury, and the Executive Director of RSAI will inform the recipient(s) of the Award. 3.5 The Awardee(s) will be invited to attend one of the Supra-Regional (NARSC, ERSA, PRSCO) meetings or the RSAI World Congress to receive the Award.